First of all, I am a huge Studio Ghibli fan that enjoys the wonderful animated movies the company creates. Classics like Princess Mononoke, Spirited Away, Howl’s Moving Castle and more have played a great part in tempering my love for these types of movies. 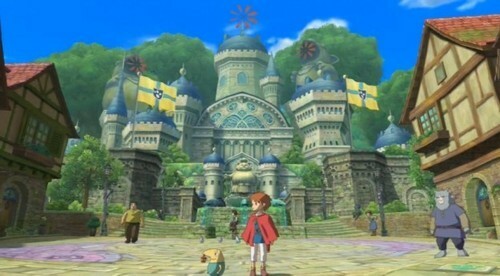 When Ni No Kuni: Wrath of the White Witch was announced for the PS3 as an exclusive, I knew from the start the game would be an instant classic for me. After having my hands on the game for quite some time now, everything about this title practically screams Studio Ghibli and I love it! Level-5 and Studio Ghibli did an amazing job with Ni No Kuni; even though it can be overbearingly childish at times. Make no mistake however…the child like charm works in the game’s favor. 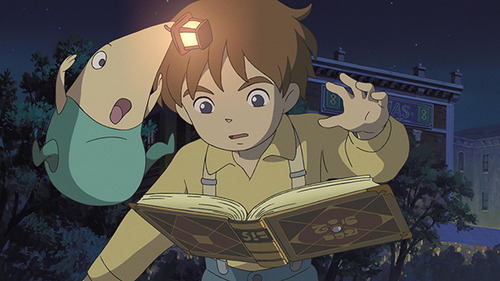 *Spoiler* Ni No Kuni starts off as one might expect it to: everything is going just great for thirteen year old Oliver (the protagonist) and his mother in their hometown of Motorville until something goes horribly wrong and Oliver’s mother passes away. *Spoiler End* Stuck in his grief, the only thing that pulls Oliver away from his pain is the magically fairy that comes to life in the child’s hands. This fairy known as Drippy informs Oliver that he can bring his mother back to life if he travels to another world and saves it from the clutches of the evil djinn called Shadar. The story itself is an emotional ride because of the lengths a child will go to save a loved one. 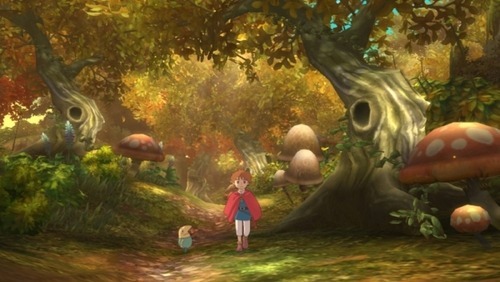 I often compare the story and general feel of Ni No Kuni to Ponyo seeing how both of them are aimed at children but can be enjoyed by adults as well. The one thing I absolutely love about this title is how it really feels like a Studio Ghibli movie. When I wasn’t conversing with NPCs via text message, the cutscenes truly brought out the awesome animations and could even be mistaken for an actual movie. Part of me wishes that the dialogue had voice acting every time characters spoke to major NPCs. Instead, there’s a lot of reading involved in Ni No Kuni which might discourage some folks who aren’t used to RPGs. There are moments where a cutscene will include voice acting (mostly for major events) and when the visuals will replicate Ghibli’s traditional animation. When I saw the first major cutscene, I was shocked at how well it looked compared to Ghibli movies. The voice acting in my opinion is pretty good as well. There was no overly high pitched voice or some accent stretched too far; everything hit an accord just right as far as I’m concerned. While the game may look and feel like its movie counterparts, the most important detail is how it all plays out. If an RPG only offers up a good story but terrible gameplay; its setting itself for failure. Fortunately for Ni No Kuni, the gameplay is really engrossing and requires a little bit more strategy than one would think. To me, it blends elements of old school RPGs, the Tales of series and oddly enough, Pokemon to create a wonderful mix. 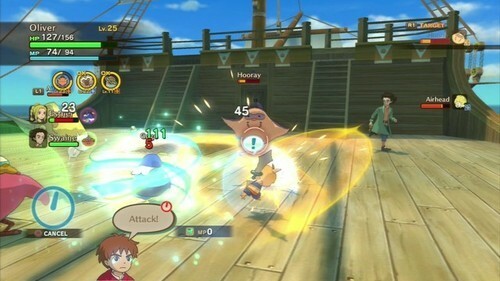 Navigating in Ni No Kuni is a standard RPG affair. While controlling Oliver and his group, players will travel through a wide variety of different locations. Along the way, towns and cities can be visited to progress the story along and are often used as main hub centrals. Running low on items or need to equip new weapons or armor? Going into said towns and cities can solve your problems in no time. If your party is feeling wary, the inn allows you to relax and gain back your strength. Even though this game has a main plotline to follow, there are a multitude of side quests to be completed. The side quests are mostly just fetch assignments and if you get bored with those, there are some bounty hunts to take on. Finishing a side quest or bounty hunt awards you with items, guilders (the game’s currency) and merit stamps. Speaking of merit stamps, if you get enough of them by doing side quests, you can complete what is called merit stamp cards. Once a card has the entire merit stamp spots filled, you can cash the cards in for merit awards which are special boosts that can be used in and out of battles. For example, by cashing in two merit cards, I picked up an award called Jackpot and it caused more glims to appear during battle. I’ll explain more about glims when I touch on the combat. It goes without saying that if you want these special perks to help out; you’ll need to do as many side quests as possible. What kind of RPG would this be if it didn’t have a lot of monster battles? 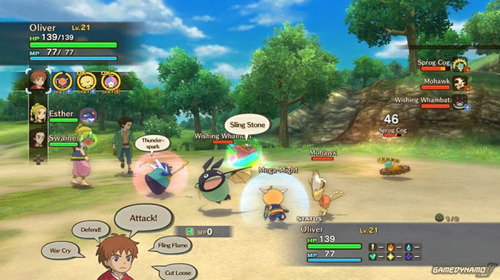 Throughout the entire game, players will have to do battle with vicious creatures that roam the fields and dungeons. Unlike some RPG’s, the battles don’t occur randomly; the monsters can be seen before they attack you. If you so choose, battles can be avoided to an extent but not so often. The monsters can generally catch up to Oliver if he tries to escape which isn’t good because they can attack from behind, giving them the upper hand in battle. On the flip side, Oliver can sneak up on enemies to initiate the fight and gain the upper hand. Once contact is made between Oliver and the creature, that is when the combat begins. There’s a few thing you should know about the combat. First would be that characters can run around the arena freely and avoid taking damage. Second is how players can either choose Oliver to fight, his other party members or the creatures known as Familiars. Familiars act like an extension of the character you control and offer different abilities depending on the kind of familiar being used. This is where the Pokemon-esque mechanic comes into play. Early in the game, Oliver will meet a young girl named Esther and she has the ability to tame wild creatures encountered in battle. After wailing on a monster long enough, there’s a random chance that the monster can be tamed and when Esther can shine. Familiars can also evolve or metamorph into older versions of themselves. Even though their level drops back down to 1, as they level up again, they become much, much stronger. During battles, switching characters can be done on the fly, resulting in some strategic use of abilities. Since Oliver is a wizard, he can use spells to attack enemies or to help out his allies. While Oliver might be good at casting spells, he’s not so good at dealing out physical damage and may require a familiar for physical attacks. The combat even gets more in depth with the timing for countering and defending. If you time these tactics correctly, players will see these glowing blue, green or gold orbs on the field. These are the glims I mentioned earlier and they restore MP and HP respectively. The golden glims are special because not only do they fully restore HP but allow players to pull off special moves that unfold through short animations and deal heavy damage. The combat is definitely hands on and requires attention to enemies and allies alike. Simply mashing the X button doesn’t help and I had to learn that the hard way. There is a learning curve involved here but once I got the hang of what did what, I was breezing through battles in a snap. As long as you have patience for the amount of information the game teaches you, everything should fall into place. For a game that appears childish, I wasn’t expecting the combat to be so involved. I actually died about 10 times until I got the hang of all the proper mechanics. So is Ni No Kuni a hard game? Absolutely not even with the learning curve at the beginning. Once you absorb all the information thrown at you and get a proper feel for the combat, you’ll be capturing and defeating monsters in no time. If you have no experience with RPGs whatsoever, you might have a hard time getting used to the game. 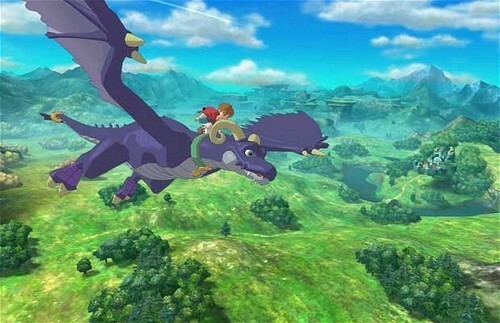 I’ve actually talked with a number of people who haven’t played a RPG once in their lives but picked up Ni No Kuni. With that said, I do have a word of caution for those that would buy this game just because Studio Ghibli’s name is on it: don’t be discouraged if you keep on losing. RPGs have to be understood before progression can be made. Stick to it and you’ll grind through eventually. Personally, I have no real qualms about this title. The combat is smooth and strategic, the story progresses well and invokes emotion and the game is a real beauty. At times, I often found the game to be too childish for its own good and there are moments where things just don’t make sense. I mean… why do I have to backtrack to a certain area only to return back to my previous location to get something done? Especially when that something could have easily been achieved without the unnecessary backtracking. The dialogue can also be way too childlike and predictable. These smalls issues of mine do not hinder the game heavily and most certainly aren’t gamebreaking. I’ll say it again but out of all the ghibli movies, Ni No Kuni reminds me of Ponyo the most. So if you liked Ponyo (and I did) then you should be just fine with Oliver’s adventure. Ni No Kuni: Wrath of the White Witch is an amazingly good time. Being a fan of both RPGs and Studio Ghibli movies, I thoroughly enjoyed my experience here. If this serves as an example, I would love to see future titles where Studio Ghibli has a hand in the production. Value Verdict: It goes without saying that if you are a fan of RPGs and Studio Ghibil’s work, pick this up. If you are feeling hesitant, just wait until the price drops to what suits you.